It may be a little late in the day, but it's still Valentine's Day. 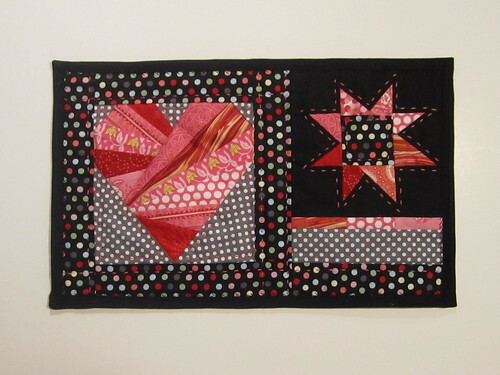 In the last week or so I've been working on this little mini quilt -- in part because it's cute and I wanted to work on something small and in part because I wanted to submit something to Pink Chalk's I Heart February contest. The finished size is approximately 9x15 inches. 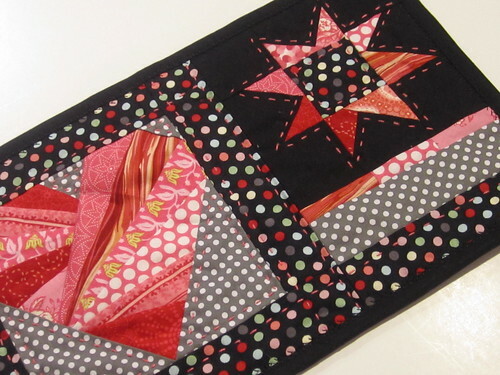 For the heart, I used this foundation piecing pattern; I paired it with a wonky star for a little more interest. The fabric is all from my stash (I like to buy pinks). I also made my first attempt at machine binding, using a decorative stitch on my machine. I need more practice, but I'm happy with how it turned out.